Having a good representation of the terrain we want to cross is very helpful – already while we are planning for the journey. It helps tremendously while we are actually in the field conquering the practical obstacles and finding possible alternative solutions. ORVI Navigator is your map, your blueprint, your navigation tool for the land of HRM processes. It explains how everything is interrelated. It shows from where everything must be derived. It helps to understand the flaws while we are re-establishing organisational vitality. Understand ORVI Navigator and it will save the day for you. There are many boxes and many arrows in the picture below. Yet this is the simplest representation of HRM we have been able to come up with without being too simplistic. It is worth studying. We have seen very elaborated systems in many of the boxes many times in different companies. But the arrows were missing. Without the logical connections among the processes and the flow of meaningful data among them the whole never functions. The processes are interdependent. To quite a big extent the weakest link defines the performance of the whole. Consider developing them proportionally. Neglect none of them. Business strategy is the defining starting point. Everything flows out of the strategic intent (mission, vision, objectives, strategy). Everything is here to support strategy deployment i.e. implementation, execution and even improvement, adaptation. The organisation is a tool of the strategy. We need to organise congruently with the strategy and we need to specify what kind of people we need. What kind of knowledge, skills, capabilities and even attitudes the strategy demands from the employees? What are the requirements for the job? The design of reward and sanction system derives from the organisation and from the requirements. It would be worth considering to connect it with performance management through goal setting and competency development. There are many issues in HR that need to be legally framed. We need to comply with many laws and regulations. We need to take care of the documents and the data properly. We need to break down the objectives from the strategy and the annual plan into smaller pieces (targets and tasks) that can be assigned to each individual member of our organisation. The better each individual understands what one needs to achieve and to do (targets, tasks) and the better one understands how this fits into the whole, the more likely we will successfully execute the strategy. In many ways, it is the focal point and the most important task of any leader to make their people crystal clear about what needs to be done now, today, this year. After we know what each individual needs to achieve we can help them with developing the missing competences. For what purpose? To improve their performance for today and even more for the future. Through the process of recruitment and selection we acquire new employees. When we know exactly why we need them and what the requirements are this task becomes less haunting. Career can only happen when we have a match between the future needs of the organisation on one side and the ambition, capabilities and potential of the individual on the other. It is a direction and an opportunity and not a promise of a future managerial position. People need to be trained in accordance with the (organisational) needs. The needs are defined from the strategy/requirements, from the performance gap and competency gap. The training outcomes are one of the useful inputs into Diagnostics. We need data. We need it for developing individuals. 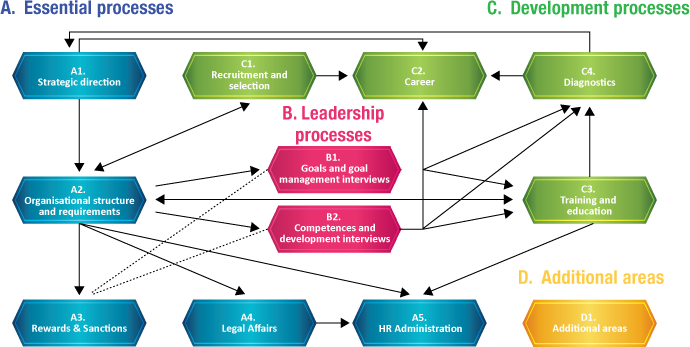 We need it for developing the organisational structure. We need it for analysing performance. We need it as an input into the development of the next strategic intent. Here we can put whatever is missing above: the issues that might be generally beneficial or might be specific for your industry or company. Some examples would be: health prevention, safety at work, internal communication, employee meals, family friendliness, counselling (substance abuse, family, psychological, …), recreation activities, etc. Which tool does your organization need?